Can you believe Halloween is this week. Over on the outlawz's blog the theme for this weeks challenge is .... Just that Halloween. So go on over and play along never know you just might have a fun time playing along. Have a great week and go scare somebody. Love your Halloween card! She looks so saucy! 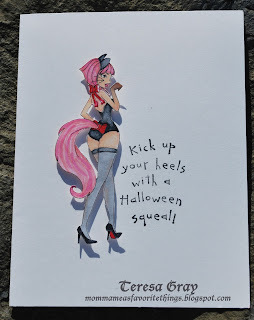 Adorable Halloween card! Love the clean and simple which makes the image pop! Hugz and Happy Holidays!